August Schrader immigrated from Hanover, Germany, to New York in 1843. Within a few years he started a small company making brass fittings for the rubber industry, which had been started only a few years before. In l890, pnuematic tires were in use on the bicycle racing circuit, and soon bikes with pnuematic tires began winning the races. A tire manufacturer asked Schrader to design a better air valve than the one they were using, and Schrader did so. 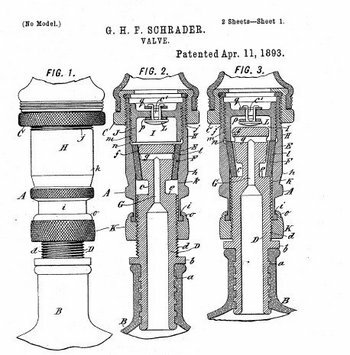 Schrader and his son George applied for a patent on their design in 1893, and made many improvements over the years. Every car today uses Schrader valves to keep the air in the tire, whether tube or tubeless tires. Most bicycles today use Schrader valves, with certain tubes using an alternative valve, the Presta valve. The Schrader valves used today are very similar to the 1893 version. August Schrader was quite a guy. because I just invented a whole new car. Oh, and yes, it uses Schrader tire valves! My relatives were geniuses but the Schrader Valve was invented more than 100 years ago. You would not believe what I’m working on in my small laboratory now. and better. You can donate anytime.